If you want to get free travel you can’t go wrong with Chase Ultimate Rewards points, because transferable points give you the most flexibility for award travel. When it comes to travel, flights and hotels are a big part of the expense. But did you know you can use your Chase Ultimate Rewards points for more than just hotels and flights with travel partners? The Chase Travel Portal is a powerful tool you can use to book rental cars, tours, event tickets, and more with Chase Ultimate Rewards points! 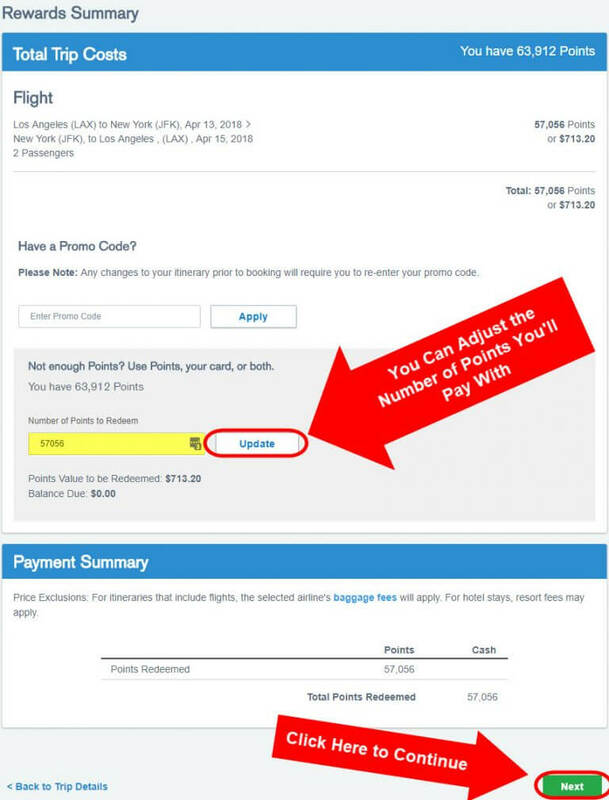 And it’s super easy to book travel with the Chase Ultimate Rewards Travel Portal. You Can Use Chase Ultimate Rewards Points to Book Travel Through the Chase Ultimate Rewards Travel Portal – Much More Than Just Flights & Hotels. You Can Also Pay for Activities Like Surfing Lessons! I’ll show you, step by step, how to book flights, hotels, rental cars, and other activities through the Chase Travel Portal. But first, you’ll want to know what your Chase Ultimate Rewards points are worth, because they do NOT all have the same value. Depending on which Chase credit card you have, your Chase Ultimate Rewards points have a different value when used to book travel through the Chase Travel Portal. Chase Ultimate Rewards points are easy to transfer between cards, to a member of your household, or to a joint business owner. So you should always be able to redeem for the highest value. To access the Chase Travel portal, you will need a Chase credit card that earns Chase Ultimate Rewards points. First, you need to log into your Chase account. Once you’re logged in, you’ll need to get to the Chase Ultimate Rewards page. On the right side, click the “Ultimate Rewards” box. Or if your homepage looks like the one below, you’ll have to scroll down and click on the “Ultimate Rewards” tab on the bottom left side of the screen. If you have multiple Chase Ultimate Rewards points earning credit cards, you’ll need to choose which card’s points to book your travel with. Typically, you’ll want to go with the card that has the highest value per point, as shown in the earlier table. Now you’re ready to search for and book your travel! You can book flights, hotels, rental cars, and various activities with your Chase Ultimate Rewards points through the Chase Travel Portal. I’ll show you how to search for each type of travel. And at the end, I’ll show you how to finish the booking process, which is almost exactly the same for each booking. Some folks love booking flights through the Chase Travel Portal because you don’t have to worry about blackout dates. And you’ll earn frequent flyer miles at the same time! And sometimes, you can save points on flights too! Now, enter the cities, dates, number of people, and the class you want to fly. You can also choose to search for only non-stop flights and you can include flights with multiple airlines. 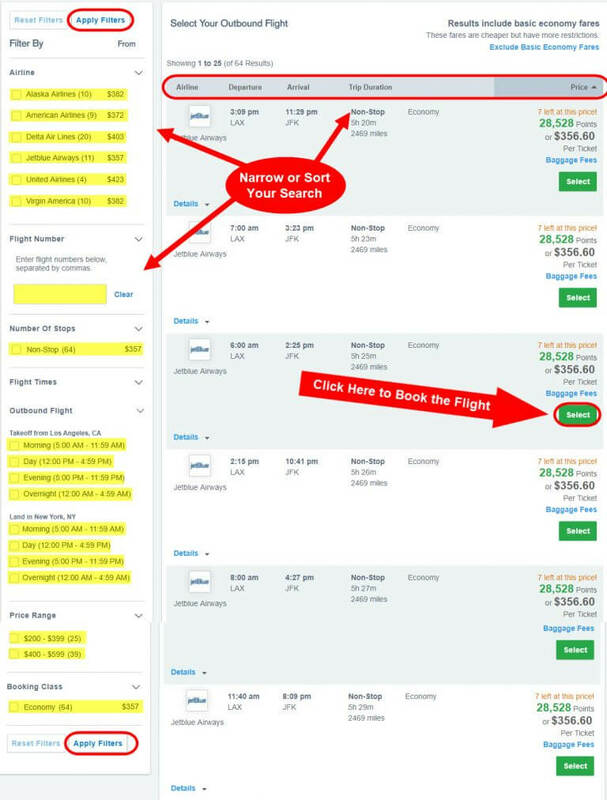 Click the “Search” button to look for flights. You can also sort your search results by the airline, departure time, arrival time, trip duration, and the price. Then click the “Select” button beside the flight you want. If you are booking a round-trip or multiple destination journey, you’ll need to choose your next flight. Follow the same steps as above for refining your search. Then click the appropriate “Select” button. 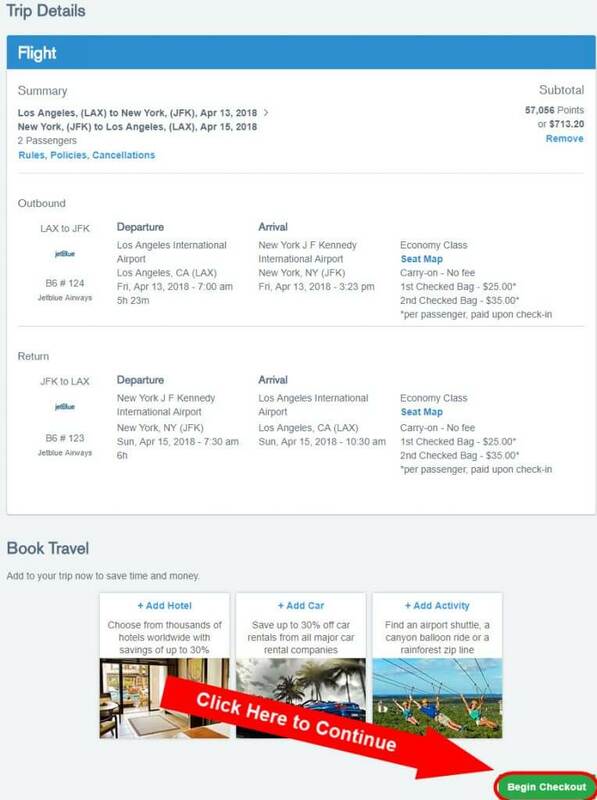 Now you’re ready to confirm and book your flight. You can skip down to the “Finish Your Booking” section. With the Chase Travel Portal, you can book hotels that aren’t transfer partners with Chase Ultimate Rewards! And there are some situations where booking hotels through the Chase Travel Portal will cost fewer points than transferring to a travel partner. Start your search by selecting “Hotels” and entering the city, dates, and number of people that will be staying. Now you have the option to view a map of the hotels. Or you can narrow your search by hotel name, price range, whether or not it’s refundable, star rating, amenities, and TripAdvisor rating. 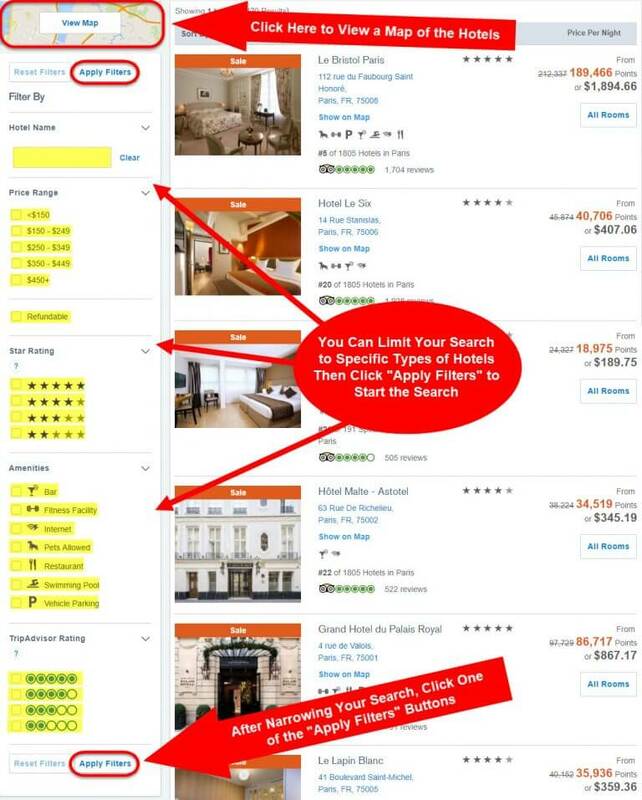 Then click “Apply Filters” to refine your search. 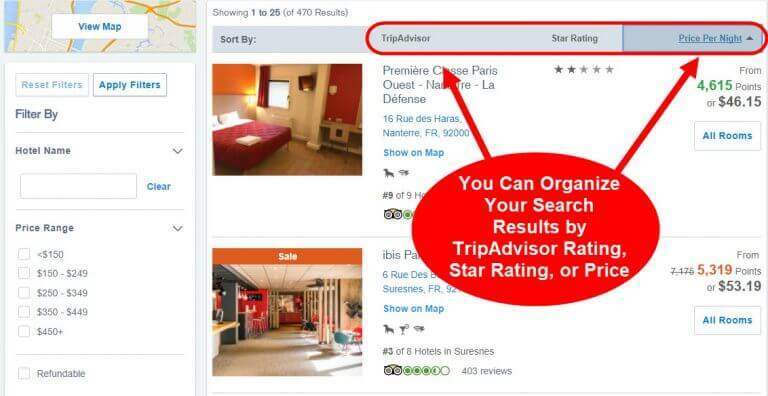 And once your search is complete, you can sort your results by the TripAdvisor rating, star rating or price per night. Once you’ve found the hotel you want, click the “All Rooms” button beside it to continue your booking. To see the steps for completing your booking, skip to the “Finish Your Booking” section. One of the great things about booking a rental car through the Chase Travel Portal is you can still get primary rental car insurance! But you’ll have to pay with the points (or card) associated with a Chase Ultimate Rewards card that comes with primary rental car insurance, like the Chase Sapphire Preferred Card or Chase Sapphire Reserve. Start by selecting the “Cars” tab. Now you can enter your pick-up and drop-off locations (they can be the same), dates and times of your trip, and the age of the driver. Continue by clicking the “Search” button. You can refine your search results by the car’s options (automatic, air conditioning, etc. ), car type, and the rental car company. Then click one of the “Apply Filters” buttons to narrow your search. Or you can sort the search by car type, company, and price per day. Once you’ve figured out where you’re staying and how you’re getting there, you’ll want to book things to do on your trip. And you can do that through the Chase Travel Portal with your Chase Ultimate Rewards points! Select the “Activities” tab and enter the city and dates of your trip. Then click the “Search” button. You can also sort the results by activity, category, and price. At this point, you can change the date or number of people if you want to. Otherwise, click the “Book This Activity” button. Now you’re ready to finish booking your activity! These steps will be almost exactly the same for each different type of booking. But when you’re booking a flight you’ll have to enter a little more information. So I’ll show you screenshots from a flight booking. This is your chance to double check you’ve made the right booking on the dates you want to travel. 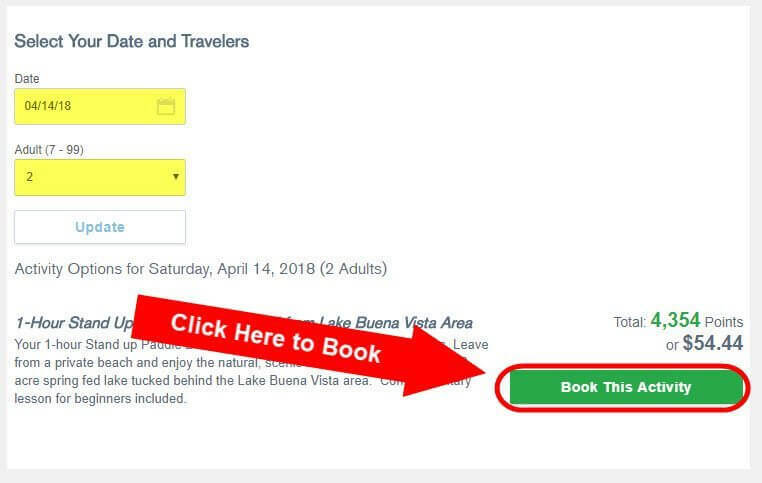 Once you’ve confirmed the trip’s details, click “Begin Checkout” to continue. You can pay for your entire booking with Chase Ultimate Rewards points or you can pay with a combination of points and cash. If you want to change how you are paying, make sure you click the “Update” button or the change won’t go through. On the bottom right of the screen, click “Next” to continue. Now you’ll need to enter the personal information of all travelers, including first and last names, email addresses, gender, and date of birth. When booking flights you’ll have to enter every traveler’s information. But this isn’t the case with hotels, rental cars, etc. You’ll also be able to add your loyalty account number (frequent flyer, hotel, etc.). You will earn frequent flyer miles or points on your flights! But hotel and car rental bookings will NOT earn miles or points. 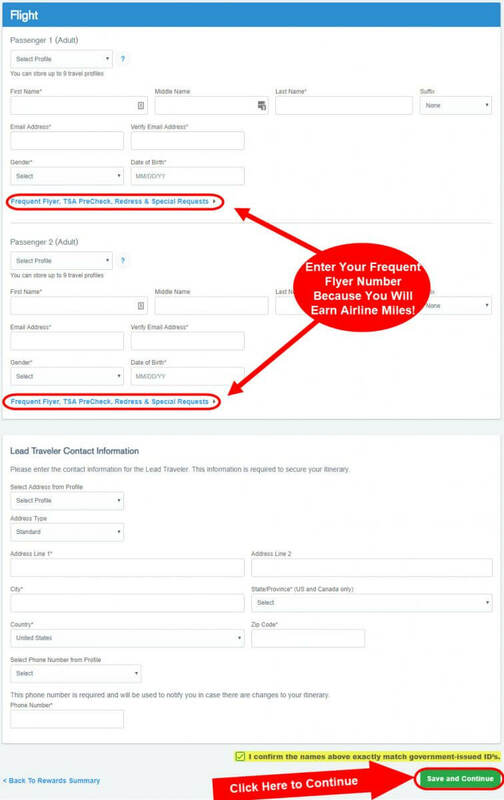 For flights, you’ll have the additional step of adding the “Lead Traveler Contact Information.” This is the contact information for one of the passengers, most likely you. The last thing you’ll have to do before you can click “Save and Continue” is check the small box to confirm the names match their government-issued IDs. After this step, you’ll be brought to the payment section where you can enter your credit card information and finish your booking. Chase Ultimate Rewards points are our favorite transferable points for a lot of reasons. They transfer to lots of great travel partners. And they’re easy to earn! But they are even more useful than that! You can use the Chase Travel Portal to book everything from rental cars to boat tours to concert tickets. This makes it easy to use your Chase Ultimate Rewards points to save on the other travel expenses besides just flights and hotels. 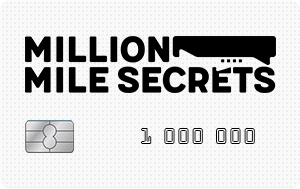 What is your favorite way to use Chase Ultimate Rewards points? Let us know in the comments! How to decide on the best American Express card to make your travel dreams a reality. Looking to earn American Airlines miles? Here’s our guide to finding the best American Airlines credit card. Everyone in the miles & points hobby should know about the Southwest Companion Pass. It’s the BEST deal in travel! Can I book travel through the Chase rewards site and pay all cash and no rewards points? Is there any advantage to doing this other than getting the points that I would get just by paying with my Sapphire card on any other site? Except when it doesn’t Work — we’ve been trying to book a flight on our Chase rewards for FOUR days — hours on the phone with the third party booking and they can’t make it happen — 150,000 points and we can’t book a flight. Ridiculous — WORST REWARD CARD EVER!!! I booked a flight for two to Las Vegas for Dec 27. I have gotten no comformation or itinerary. Requested written. After reading this I booked a car rental using the UR portal. I found the price for 2 days was equal to Hotwire, Priceline and prepay with Alamo. I decided to try the UR booking and used points and cash knowing the cancellation policy wasn’t that great. After arriving in Seattle I was hit with all the taxes that was stilled owed, about $24.00 a day more. I could not cancel and go somewhere else so there I was using my UR card to pay or have nothing. I have never had this happen before in a reservation with any other portal or car agency. UR agents said that taxes are NOT included in the price they quote. SO BEWARE! With the car rentals charging taxes and such fees its with accordiance with their own polices, the prices we have online for rentals or any type of bookings is what we have, the airlines, hotels and car rental companies have other fees and rules they have to follow, so yes we are obligated to say taxes are not included unless it is with accordiance to the policies and procedures of the car company, airline, or hotel or whatever trip you are booking. our rules are set, so are theirs. 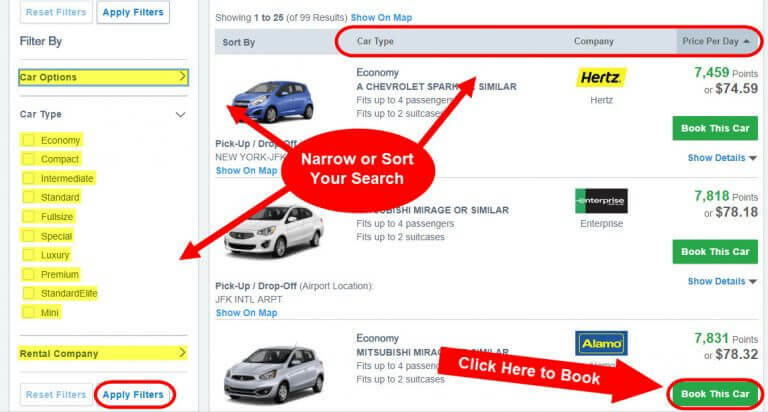 some car rental places can be a little ridiculous and they are very hard to communicate with.. Some airlines won’t show up on the Chase Travel Portal, so you have to call to book. 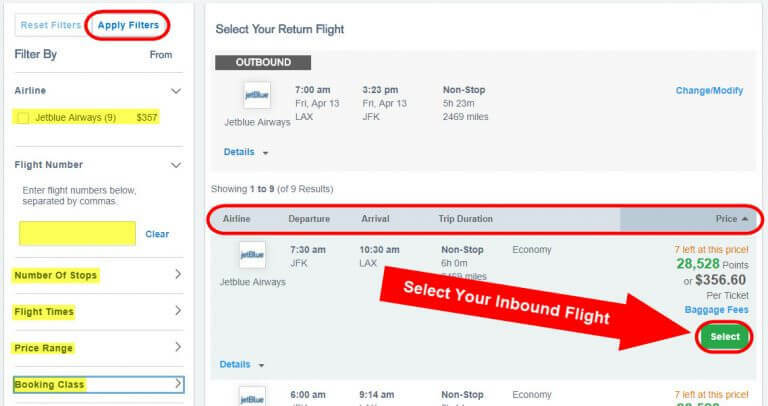 You should be able to follow the same steps to book flights over the phone that aren’t showing up online.